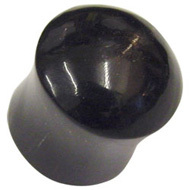 Treat your ears to comfort and style with our range of natural buffalo horn flesh plugs. 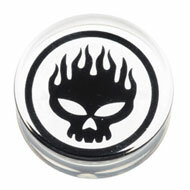 These plugs look great, feel comfortable and are a great option if your ears react to metal and plastic flesh tunnels. All our buffalo horn flesh tunnels are made with horn that is naturally shed and ethically obtained, without harming the water buffalo. It is a great natural material that is biocompatible and can be made into a huge variety of stylish jewellery. Water buffalo horn is non-reactive, so it will not irritate your ears. It helps to reduce odour and is very lightweight, so it will not stretch your ears gradually over time. The horn can also be polished to a very smooth finish, which makes it easy to insert into a new stretching. We have a huge range of buffalo flesh tunnels, some of which you can see below. These buffalo flesh plugs are made from solid sections of horn, painted and carved to give you a great choice of styles. As well as plain plugs we also have a huge range of cool designs, including triangular and square flesh plugs. All of our buffalo horn plugs are double flared, which means that they stay securely in your ears and do not require O-rings. 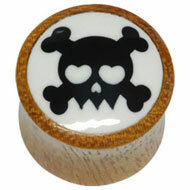 For something a little more special, check out our selection of inlaid buffalo horn flesh plugs. 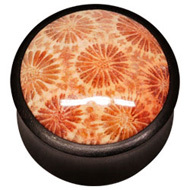 These plugs feature a variety of eye-catching materials, from fossilized coral and natural stone to sparkly Swarovski crystals. They mean that you get the comfort and smoothness of buffalo horn, but with a beautiful accent. 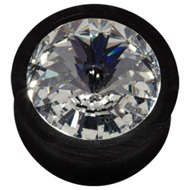 Bright and eye-catching, they make wonderful gifts for anyone with stretched ears. This entry was posted in Buffalo Body Jewellery, Stretching Jewellery and tagged Buffalo Body Jewellery, Buffalo Flesh Plugs, Buffalo Horn Body Jewellery, Buffalo Horn Flesh Plugs, Flesh Plug, flesh plugs, Natural Flesh Plugs on September 25, 2013 by Piercing Guru. 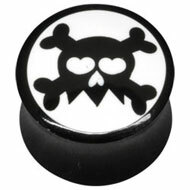 Get classic style with our great range of skull flesh plugs. 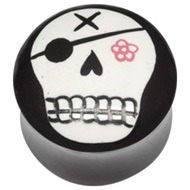 These cool flesh plugs feature all kinds of skulls, from gothic deadheads to Mexican sugar skulls. No matter what your personal style is, they are a great way to update your look and show off your stretchings. 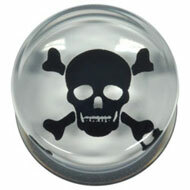 We have a great choice of skull flesh plugs made from PMMA, also known as acrylic. 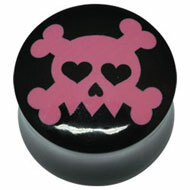 Below are just three of our PMMA skull flesh plugs. These flesh plugs are great if you like to have a different set of plugs every week – they are great value and very comfortable to wear. 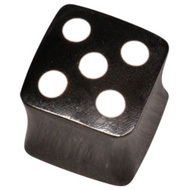 PMMA is a lightweight biocompatible plastic that feels great in your stretchings. The fact that it is lightweight means that it is ideal for large gauge plugs and won’t weigh down your ears. If you prefer to wear jewellery made from natural materials, check out our buffalo skull flesh plugs. 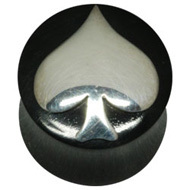 These plugs are made from naturally shed water buffalo horn – buffalo shed their horns periodically, so none are harmed in obtaining the horn for jewellery. Buffalo horn is non-irritating and completely biocompatible. Its polished surface makes it very comfortable to wear and insert into your stretchings. 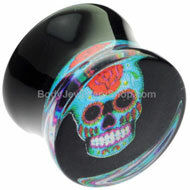 It can also be dyed and painted, giving you an amazing variety of buffalo flesh plugs to choose from. This entry was posted in Acrylic Body Jewellery, Buffalo Body Jewellery, Stretching Jewellery and tagged Acrylic Flesh Plugs, Buffalo Flesh Plugs, Buffalo Horn Flesh Plugs, flesh plugs, PMMA Flesh Plugs, Skull Flesh Plugs on November 23, 2012 by Piercing Guru.